Today's view of Rome from the Janiculum shows several changes from that shown by Giuseppe Vasi in his 1765 Grand View of Rome: some alterations are due to the influence of the French occupation of Rome in the early XIXth century (Piazza del Popolo and the Pincio gardens); many to the new role of the city after the 1870 Italian annexation (Monument to Victor Emmanuel II and Palazzo di Giustizia); others to the opening of large avenues during the Fascist period. After WWII most of these modifications came under heavy criticism and with the sole exception of a gigantic Hilton Hotel built in the 1950s on the top of Monte Mario, almost no other contemporary building can be seen from the Janiculum. There are however some very recent examples of contemporary architecture which are located in sites where they do not impact on the traditional view of Rome. In the 1970s during a state visit to Italy the late King Fahd of Saudi Arabia complained to Italian officials about the lack of a suitable mosque in Rome. At that time the Muslim community was mainly limited to the members of embassies of Muslim countries or to their envoys at the United Nations Food and Agricultural Organization located in Rome. King Fahd declared that his country was prepared to bear the cost of building a mosque, provided that the Italian authorities found an appropriate location for it. The request caused some embarrassment amongst Italian politicians, most of whom belonged to the Christian Democratic Party, who were concerned that by placing a minaret among the bell towers of Rome they would displease the Vatican. 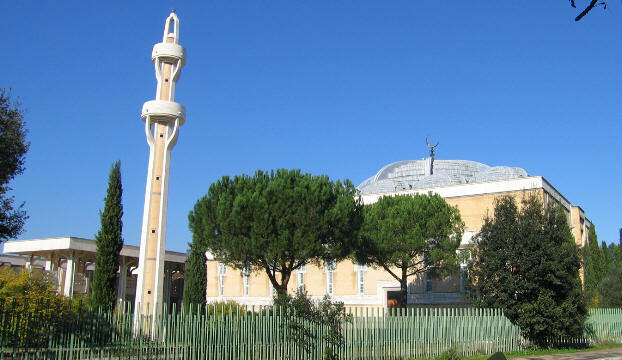 The choice of the site was therefore well pondered: the piece of land near Acqua Acetosa where the mosque was eventually built is near the modern quarter of Rome where most embassies are located and so it was easily accessible by the Muslim community of the 1970s, but at the same time a hill hid the minaret from the historical panorama of Rome. Paolo Portoghesi, a leading Italian architect and art historian, designed the mosque and the adjoining buildings, trying to strike a balance between modern architecture and the need to relate to the donor country (Saudi Arabia). Chiesa del Dio Padre Misericordioso has been conceived as a new centre for a somewhat isolated housing quarter in the Tor Tre Teste area, located outside central Rome. The church was built for the Jubilee year 2000, although it was not completed until 2003. Three great shells constitute the most impressive feature of the building; they represent sails, a reminder of the traditional iconography of the church as a boat (see the ceiling of S. Maria in Domnica). The five bells have a meaning too: they represent the five continents: a topic already existing in many other Roman monuments: from Fontana dei Quattro Fiumi to the ceiling of S. Ignazio. The curved sails offer many interesting views; however a lateral view perpendicular to the axis of the church is less satisfying because the sails seem to merge in just one shape, while by slightly varying the visual angle they return to be three. In the afternoon a small opening in the rear wall sends sun rays onto the main altar: maybe Richard Meier had in mind Bernini's Confessione, the decoration of St. Peter's apse. For centuries architects and painters have tried to show the blue sky of Rome on the ceiling of churches: modern technology and materials make that dream come true. Renzo Piano is most likely the best known living Italian architect. In 1994 he won a competition for providing Rome with a multi-function complex dedicated to music. His winning project is characterised by three "music boxes": three halls with different capacities (2800, 1200, and 700 seats) as well as an open-air amphitheatre for 3,000 people. The Rome Philharmonic Orchestra is known as Orchestra di Santa Cecilia thus named after the saint regarded as the patron of music. The main hall of the Auditorium is named after the saint too. The complex of buildings, which includes shops, cafeteria and a library is located next to Via Flaminia, not far from Tempio di S. Andrea. The domes of Rome, including St. Peter's dome are covered with lead, as this metal protects the structures below from the impact of excessive variations of the outside temperature. The way Renzo Piano has designed and assembled the lead panels covering the three halls is no doubt the most impressive feature of the auditorium. The architect had in mind the music boxes of lutes when he designed the domes of the three halls; these, however, when seen in isolation, suggest different images: gigantic insects or even a whale. You may wish to see Auditorium della Musica at night. 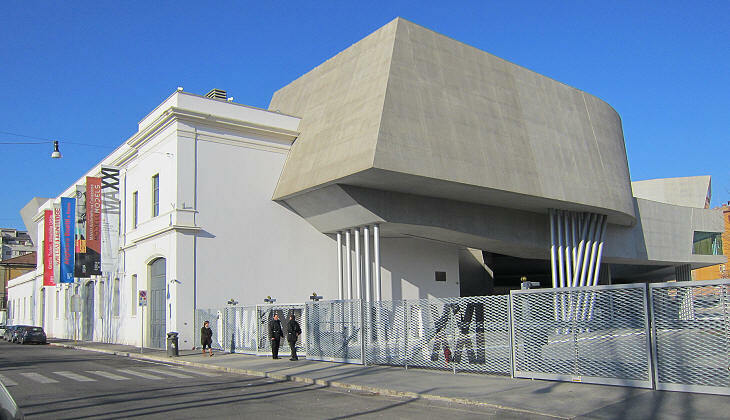 In 1998 the Italian Government decided to provide Rome with a proper Centre for Contemporary Art with the space which is required by some "installations" designed by today's artists. The site chosen was a former barracks near Via Flaminia with a very large courtyard surrounded by low early XXth century buildings. In 1999 the project developed by British architect Zaha Hadid won an international contest. One of the strong points of the project was that it took into account the urban layout of the neighbourhood and in general the landscape of Rome by avoiding the construction of a tall building, which would have modified the historical view of Rome from the Janiculum. In 2010 Zaha Hadid was awarded the Royal Institute of British Architects Stirling Prize for this project. 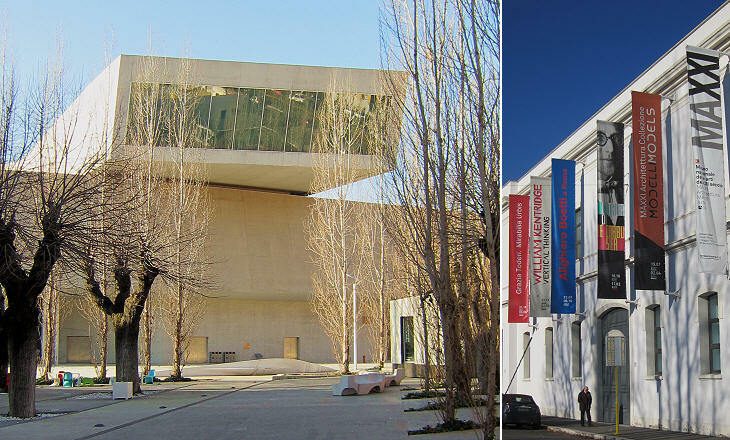 The Centre was completed in 2010 and it was eventually named MAXXI (it opens in a separate window), acronym of Museum of Arts of the XXIth century, but its interior is far from being designed as a traditional museum with a series of halls. It is rather a sort of very large winding "road" which receives a lot of light from different angles and which can be temporarily divided to house separate "installations" or events. 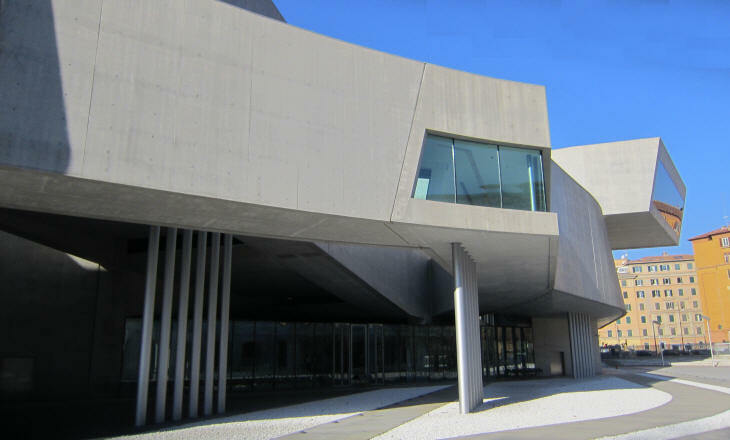 A small section of MAXXI is dedicated to a permanent exhibition of models, drawings and photos of Italian contemporary architecture. The rest of the complex houses temporary exhibitions, "installations" and events.